In a price bracket where diesel sedans rule the roost, we find out what other options you can choose from. So, here we have a crossover and a compact SUV. Find out which one best meets your needs. A car is no longer just a vehicle to get you from point A to point B. It now needs to make a statement, reflect one’s personality, and, at the same time, be practical. Being normal and predictable is passe. That’s why automobile manufacturers are coming up with more innovative designs that make their cars look bold and quirky, and make you stand out. We decided to bring two of the most sought after vehicles in the Rs. 7-10 lakh bracket. If it’s style that you’re after, though, the EcoSport has it in spades. Like it or not, it brought in a refreshing design with its imposing, high-mounted hexagonal front grille. Like the Fiat, the spare-wheel mounted on the tailgate adds to its rugged appeal. And it sails over potholes and speed breakers thanks to its impressive 200mm ground clearance. Step inside, and you’re welcomed by a space-age dashboard that also does duty in the Fiesta. Sadly, the interiors aren’t as solidly-built as Ford’s of previous years. I suspect that the price war has finally caught up with them. That being said, the front seats are supportive, snug, and provide a commanding driving position. But for the rear passengers, there’s just about enough leg-room – and fitting three in the back would be quite a squeeze. So, which one should you buy? It all comes down your priorities. If you have a large family, then the Mobilio is clearly the one for you. The spacious interiors are a revelation, but you do have to compromise slightly on refinement and build quality. 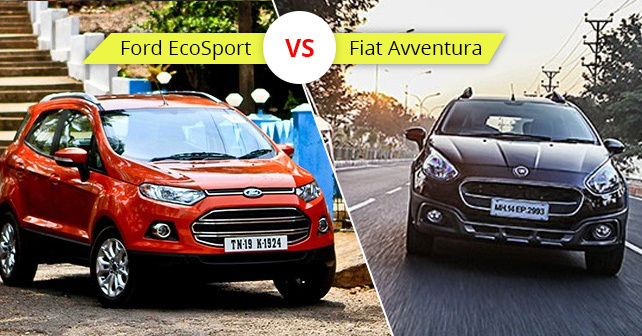 The EcoSport and Avventura are glam dolls – but when it comes quality and reliability, Ford scores over Fiat. And, as styling is a personal choice, we’ll let you decide.